The Volcanological Survey of Indonesia (VSI) reported deep volcanic and A-type earthquakes at Tongkoko (also known as Tangkoko) over the period 7 October-24 November 2002 and more deep-volcanic events during 23 December 2002-19 January 2003 (table 1). The earthquakes, which began in May 2002, were recorded following relocation of an observatory post to Wainenet village in the Bitung area. The temperature at Batu Angus hot spring on 10 October 2002 was 70-73°C. While no visible activity has been observed, the hazard status was raised to Alert Level 2 (on a scale of 1-4) on 24 October 2002 as a result of the increased seismicity. The last recorded activity at Tongkoko consisted of flank lava flows and lava dome extrusion in 1880. Table 1. Earthquakes recorded at Tongkoko, 7 October 2002-19 January 2003. In addition, one shallow volcanic event was recorded during 13-19 January 2003, and single B-type earthquakes each occurred during 21-27 October and 4-10 November 2002. Courtesy of VSI. An increase in the number of volcanic earthquakes at Tongkoko since 24 October led VSI to raise the Alert Level from 1 to 2. The number of deep volcanic earthquakes decreased in comparison to the previous week. VSI reported that the increased number of shallow volcanic earthquakes indicated that seismicity was migrating to the surface. Relocation of an observatory to the area near Tongkoko provided scientists with previously unavailable seismic data. During 7-14 October, four deep-volcanic events were recorded at Tongkoko. This is significant because the volcano has been in repose for almost 122 years. Tongkoko was at Alert Level 1 (on a scale of 1-4) (note: VSI later corrected Alert Level from 2). The eastern peninsula at the far NE end of Sulawesi near the city of Bitung is occupied by a volcanic complex consisting of two major edifices within a nature reserve. To the north is Tangkoko (also known as Tongkoko), with a large caldera (~3 x 1.5 km) elongated towards the SE from the highest rim point; the rim at the opposite end is more than 400 m lower. Eruptions occurred from the summit crater in the 17th century and in 1801, when the caldera also reportedly contained a cone surrounded by a lake. About 1.5 km down the outer E flank is the Batuangus (or Batu Angus) lava dome, formed in 1801, along with an adjacent vent (Baru Batuangus) that has been the source of all subsequent eruptions. The higher twin-peaked Duasudara (also Dua Suadara) stratovolcano is about 4.5 km SW of the Tangkoko summit. A NE-facing open crater appears to have a hummocky debris flow that reaches the base of the Tangkoko edifice. Tatsumi Y, Murasaki M, Arsadi E M, Nohda S, 1991. Geochemistry of Quaternary lavas from NE Sulawesi: transfer of subduction components into the mantle wedge. Contr Mineral Petr, 107: 137-149. There is no Deformation History data available for Tangkoko-Duasudara. There is no Emissions History data available for Tangkoko-Duasudara. 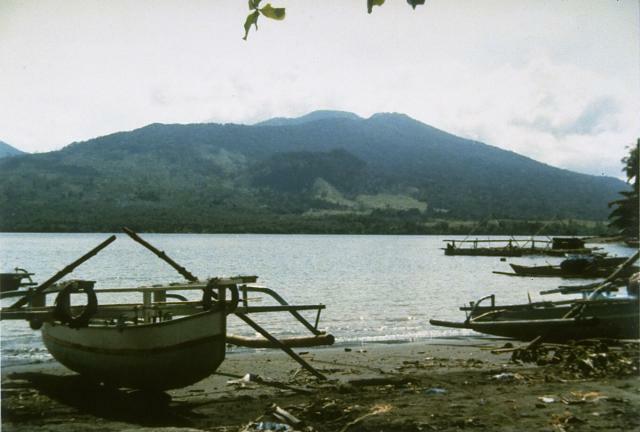 The 1149-m-high elongated Tongkoko volcano, seen in this composite photo from the south, rises above Bitung city and is the NE-most volcano on the island of Sulawesi. 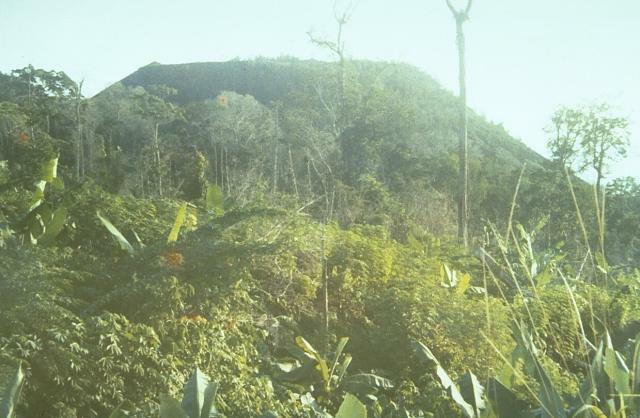 The summit of the volcano, which is elongated in a NW-SE direction, contains a large crater with a central cone. Historical eruptions have occurred since 1680 from both the summit and an east flank vent, Batu Angus. Tongkoko volcano and its neighbor Dua Saudara are the most prominent features of Gunung Dua Saudara National Park, a noted wildlife preserve. Photo by A.R. Sumailani, 1973 (Volcanological Survey of Indonesia). The forested summit of Tongkoko volcano at the NE tip of Sulawesi is truncated by a large elongated, 1 x 2 km wide crater that contains a central cone. In 1801 a crater lake was observed. Eruptions have occurred at Tongkoko during historical time from both summit and flank craters. The flat-topped Batu Angus lava dome formed on the east flank of Tongkoko volcano during an eruption in 1801. A lava flow traveled 2 km down the flank. The 1801 eruption also included formation of small cones at the bottom of the crater lake at the summit of the volcano. Tongkoko volcano, seen here from Lembe Island to the east, is a broad, 1149-m-high stratovolcano capped by a large summit crater. The lava dome Batu Angus, which formed in an eruption in 1801, can be seen on the east flank of the volcano in the center of the photo. Gunung Dua Saudara National Park, a noted wildlife preserve, extends from the volcanic highlands to offshore coral reefs. Photo by Ruska Hadian (Volcanological Survey of Indonesia). There are no samples for Tangkoko-Duasudara in the Smithsonian's NMNH Department of Mineral Sciences Rock and Ore collection. Large Eruptions of Tangkoko-Duasudara Information about large Quaternary eruptions (VEI >= 4) is cataloged in the Large Magnitude Explosive Volcanic Eruptions (LaMEVE) database of the Volcano Global Risk Identification and Analysis Project (VOGRIPA).